Langos, goose liver, pickled veggies and every tasty Hungarian morsel in between. 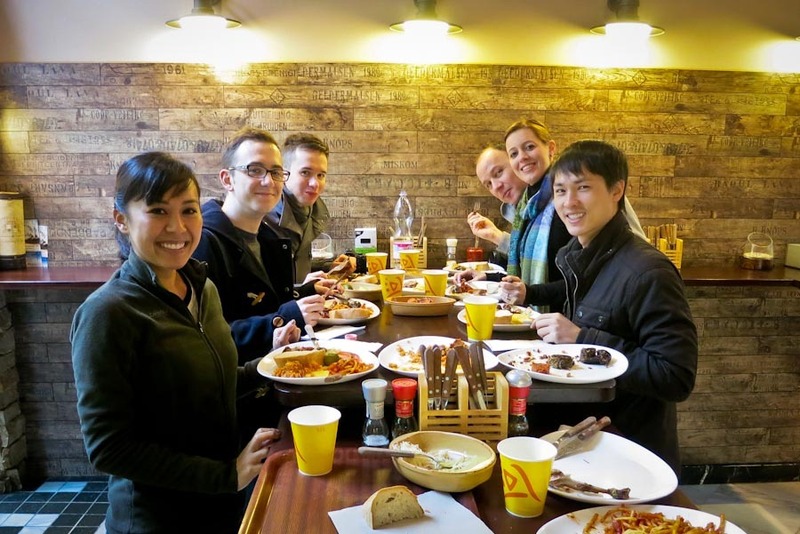 You know if there’s a food tour anywhere, Gerard and I (and our waistlines) are up for the challenge. 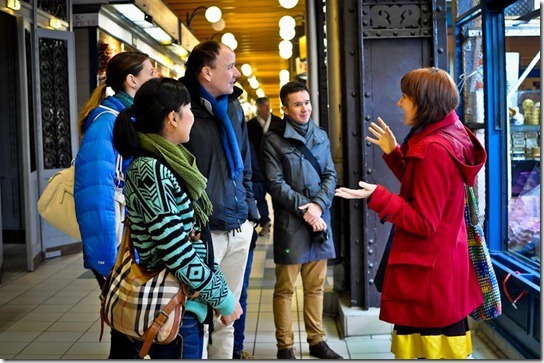 Our tour began at the Great Market Hall. We met up with Judith from Taste Hungary, our tour guide for the day along with two other couples, and the seven of us made our way upstairs to a corner bar. You know it’s a good sign when you start your day off at a bar. 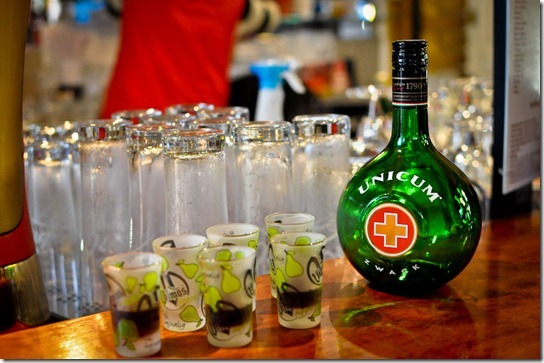 We kick start our tour, as Hungarians do, with shots of Unicum. Unicum is a strong herbal digestive liqueur. Tasted like Jagermeister to me. For G – made him sleepy. After our shots, we huddled around a small table and sampled some traditional street food – langos. 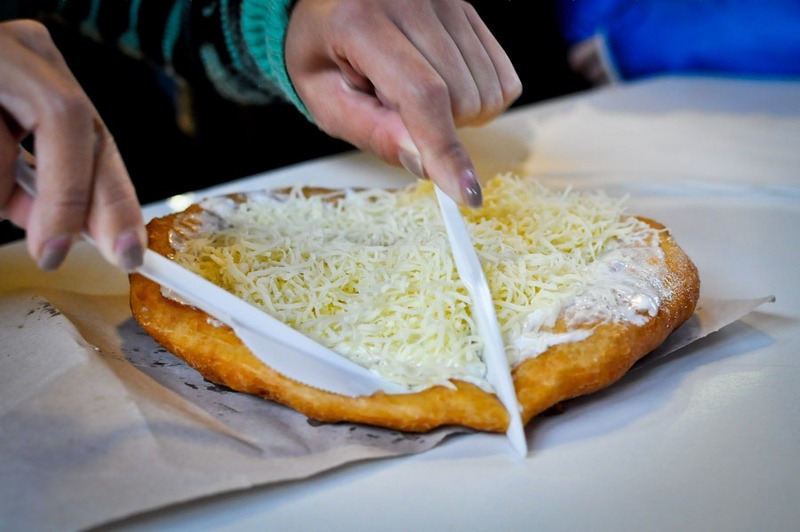 Langos is simply deep fried dough topped with garlic, sour cream and cheese. Trust me, it taste a lot better than it sounds. The dough was my favorite part. The moment I stepped inside the market, I was wondering when we’d get to the meat. It didn’t take long at all. The meat – cured meat, smoked meat – meats galore, oh my! 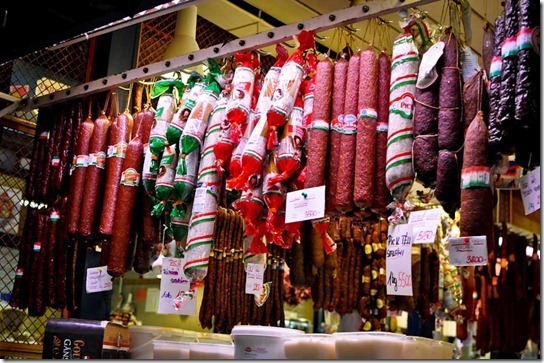 The boys went on a salami photo frenzy! 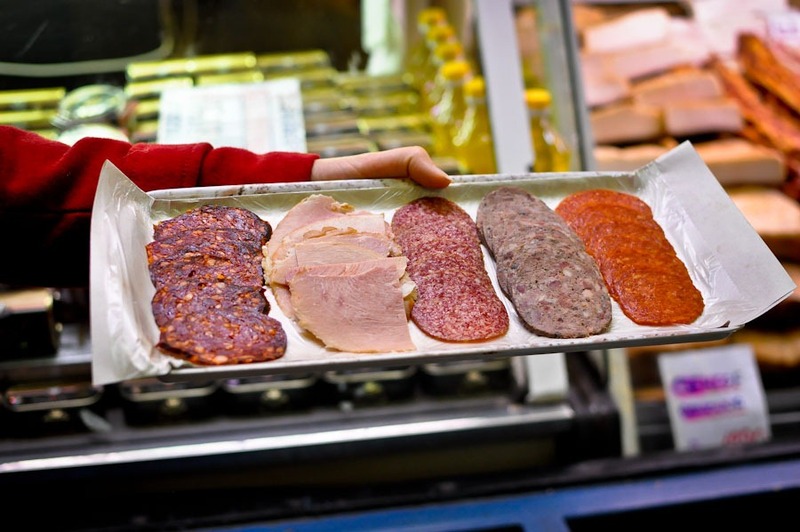 Of the many we sampled a selection of five, like smoked ham and spicy salami. Of that five, my surprised favorite was horse salami. Yes, horse! While at the salami shop, I eyed a pile of fried pork rinds. Judith notice me salivating and ordered up a handful for us to taste. It was pretty awesome. Fried pork fat, what’s not to love?! We made our way through the market passing sausage vendors, meat stalls and spice markets. We saw the norm, bacon strips and chicken breasts, stuff like that. 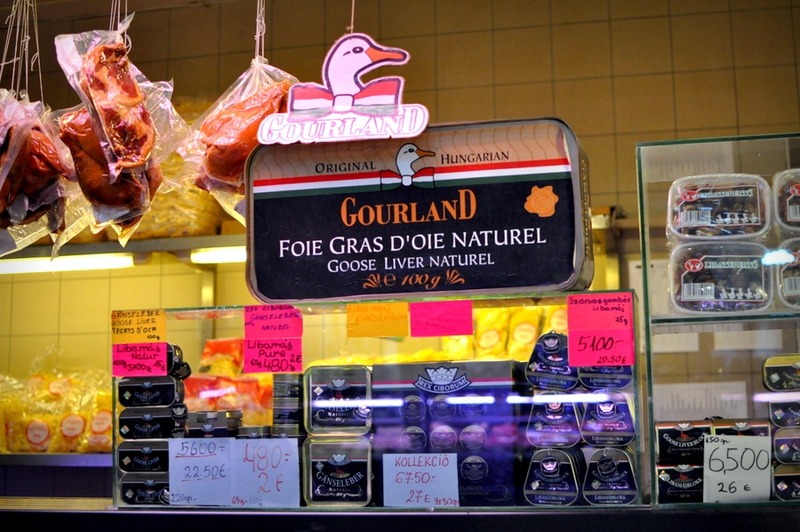 And lots of paprika..
And then there were the not so norm – cow tongue, rooster testicles and other mystery organs, and more than you could ever imagine, duck and goose liver, otherwise known as fois gras! To cleanse our palette, we sampled some local cheese and this little candy treat – a chocolate bar filled with cream cheese that’s both sweet and sour tasting at the same time. It’s a little strange and not for me. Afterward, we made our way towards the escalator, passed the mushroom Doctor and down to the fish and pickled floor for a quick sniff then headed back upstairs to peruse the fruit and vegetable aisles before leaving the market. 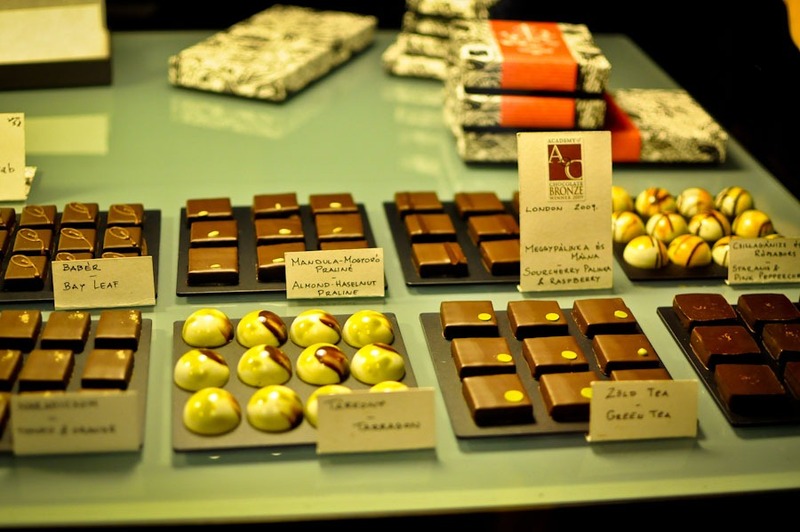 On our way to our lunch spot, we stopped by a cute local chocolate shop for a taste. Lunch at the butcher’s shop is next and here I thought we were going to sample a few sausages but nooooo.. we had a full on multi-course lunch with pickled side dishes, bread and more. 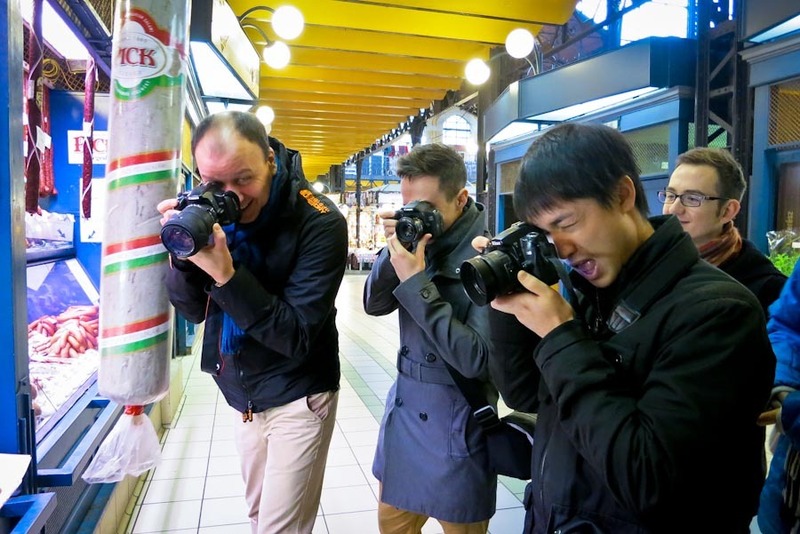 When have you ever seen that on a food tour?! My favorite dishes, another shocking surprised, are blood sausage and watermelon pickles. Completely stuffed, honestly the tour could have ended here and I’d be more than satisfied, we made our way to the famous Auguszt pastry shop for dessert! Ps., how gorgeous is that chandelier?! Talk about a sugar rush. Gerard’s favorite was the classic cheesecake, much lighter than New York style cheesecake. Three hours later, I couldn’t believe it myself – we’ve managed to eat everything in Hungary. What’s left? 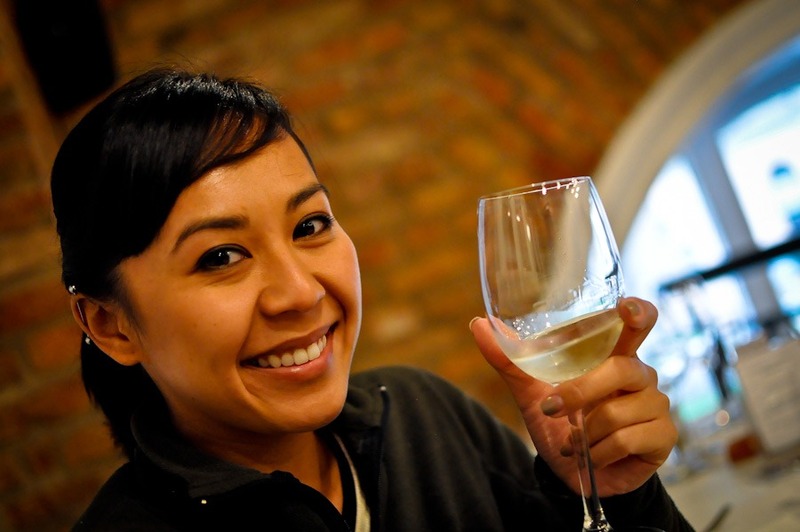 Well, since, we started with booze, we might as well end our lovely tour, appropriately, with wine! 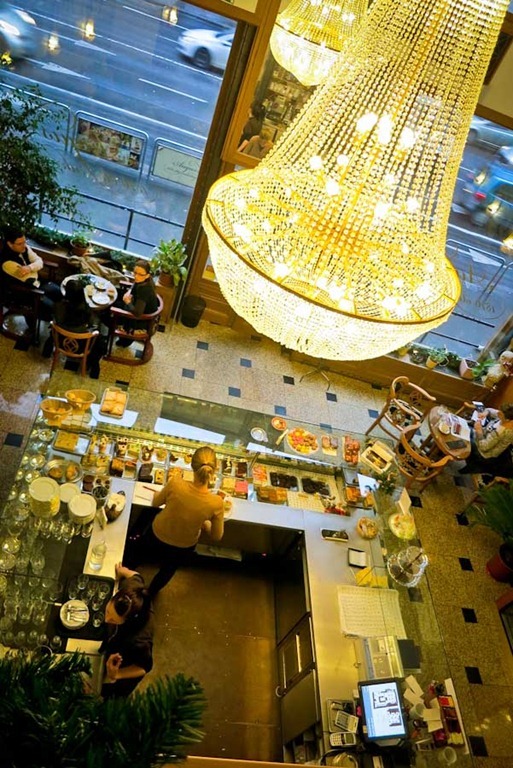 Borbirosag restaurant and wine bar is conveniently located behind the Great Market Hall and was our last stop on the tour. We tried three generous tastings and I was pleasantly surprised how wonderful Hungarian wine is. 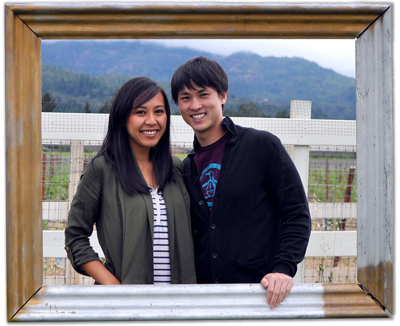 Gerard and I both enjoyed the white by Sauska – light, clean and crisp, it pairs well with fois gras. 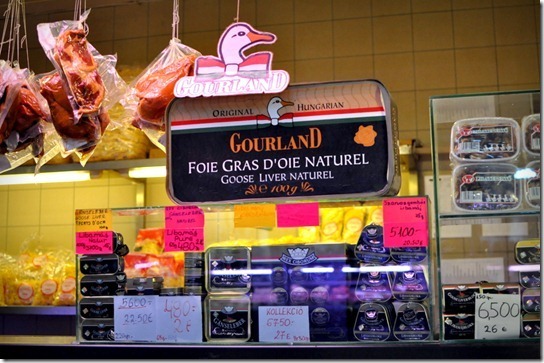 I know this because we came back for dinner and I was in fois gras heaven. That day was a deliciously great day. 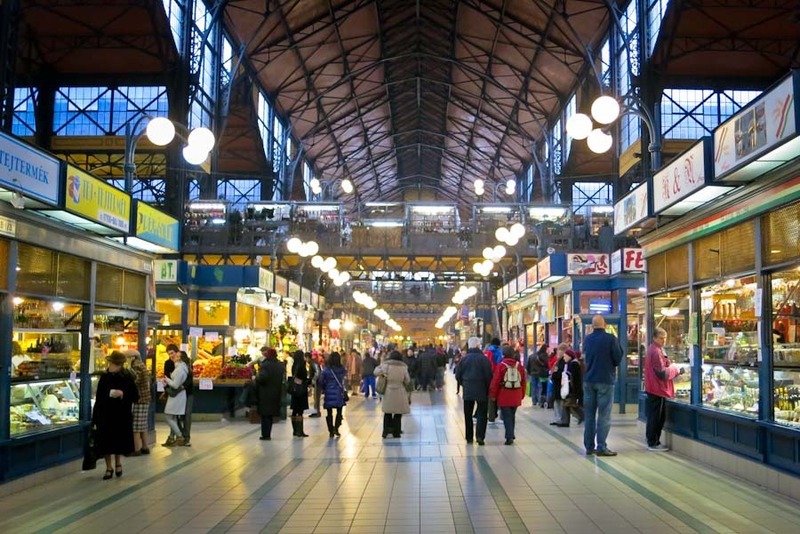 Who knew Hungarian food consists of more than just goulash? This was such a nice introduction to Budapest and thanks to Taste Hungary, we got to truly taste Hungary. 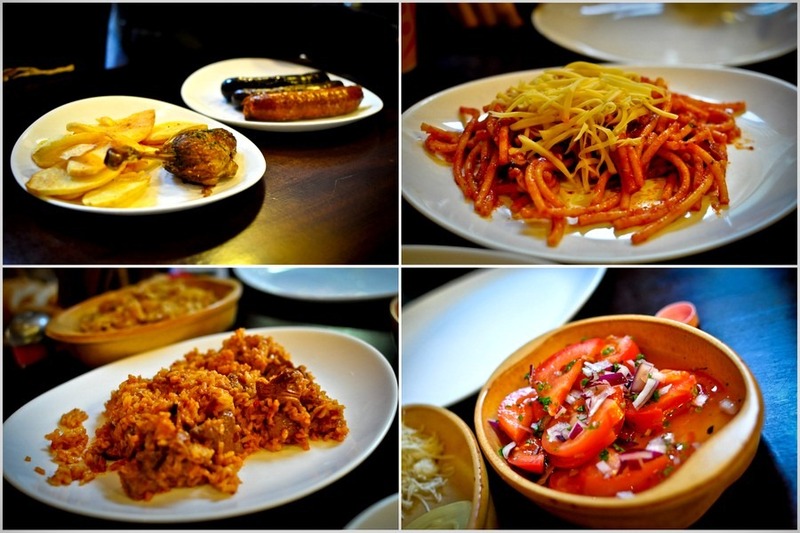 Do you have a favorite Hungarian dish? 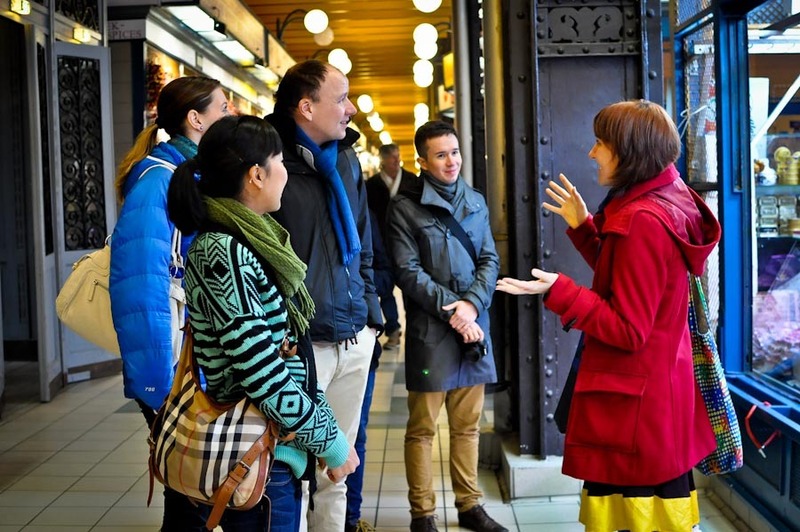 Disclaimer: We received a complimentary culinary walking tour with Taste Hungary. As always, all thoughts and savory opinions are my own. Thanks for sharing that treasure of a market! 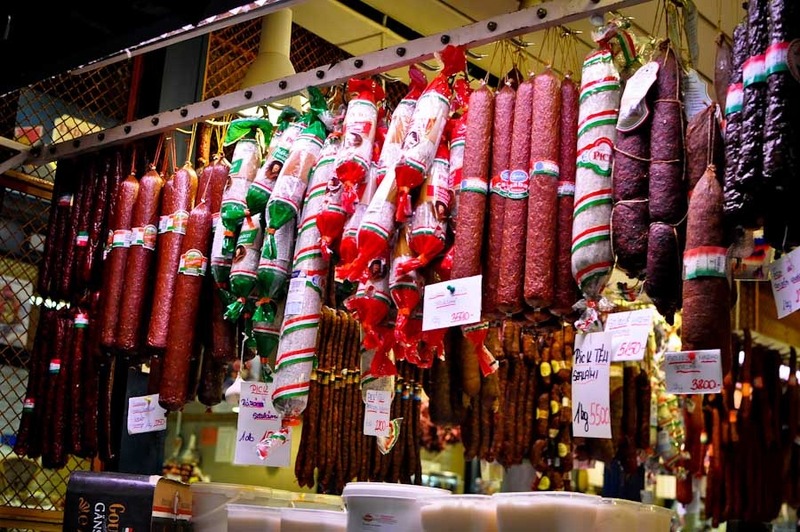 Gotta say though, the “salami photo frenzy” pic is hands-down, my fav! Haha.. I think our tour went over because of the many photo frenzies throughout the day. It was loads of fun. Oh my, that all sounds absolutely decadent! When I was traveling Budapest I was just a poor student so my meals consisted of hot dogs and crackers. I really ought to go back since food is part of experiencing a country. I love a good piece of salami! Yum, wish I knew about this tour when I visited Hungary! 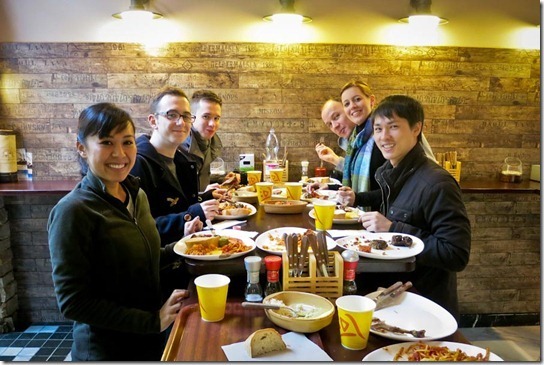 A 3 hour food tour? Sign me up! I’m definitely interested in trying some watermelon pickles and maybe even a slice of horse salami. 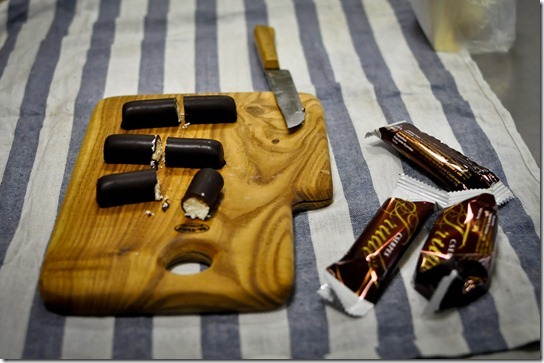 Chocolate filled with cream cheese? I AM SO IN. langos and turo rudi are already the reasons for me to go to Hungary! I always bring back home as much turo rudi as I can, it’s so damn delicious! aksjdhafga deep fried dough topped with garlic, sour cream and cheese? need. OK langos? Wow, so simple, yet so interesting. I’d love to try that. 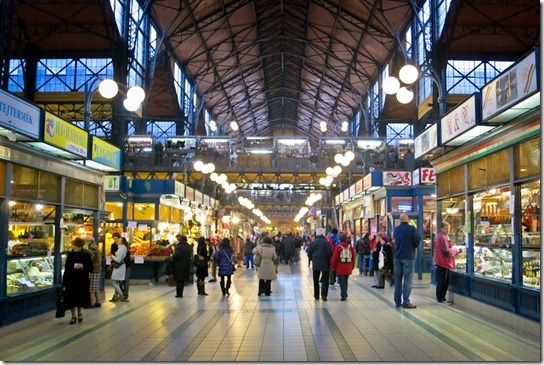 And in general, I love market halls like the one you write about. When I go back to Budapest, I’ll have to check it out! My favorite Hungarian dish would be potato pancakes with goulash (vegetarian in my case). I’ve had the best one in a Hungarian restaurant in Krakow that’s been there forever, it seems. Oh, I don’t think we tried potato pancakes. Boooo… must go back. This post is an Asians taking pictures of food goldmine! Haha! Really, the langos looks fabulous to me. I’m a sucker for sour cream. You know us!.. LOL. That lango was a shockingly good surprise for me. looks absolutely delicious – i have never heard anything about Hungarian cuisine.. interesting indeed! Me neither.. love Hungarian food now! What an epic day. You start with shots and end with wine and eat the whole country of Hungary in between. Sounds like Taste of Hungary runs a great tour. Right?! All tours should begin and end with a little booze. I’m just sayin..
how i miss the goulash & paprika. 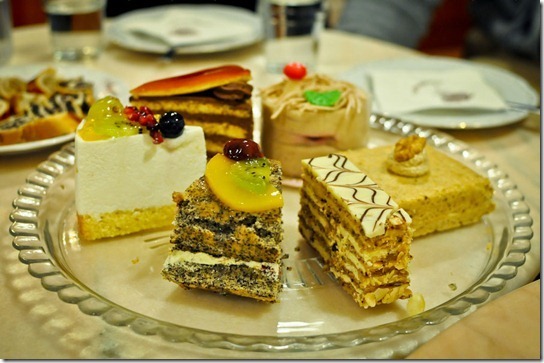 BUT i agree with you – i was so surprised by all the varieties of good food to be found in Budapest! such a great city!! I had no idea paprika was a Hungarian thing..